We’d love your help. Let us know what’s wrong with this preview of Spirit Car by Diane Wilson. One day I realized that my entire back seat was filled with relatives who wondered why I wasn’t paying more attention to their part of the family story. . . . Sooner or later they all come up to the front seat and whisper stories in my ear. Growing up in the 1950s in suburban Minneapolis, Diane Wilson had a family like everybody else’s. Her Swedish American father was a s One day I realized that my entire back seat was filled with relatives who wondered why I wasn’t paying more attention to their part of the family story. . . . Sooner or later they all come up to the front seat and whisper stories in my ear. Growing up in the 1950s in suburban Minneapolis, Diane Wilson had a family like everybody else’s. Her Swedish American father was a salesman at Sears and her mother drove her brothers to baseball practice and went to parent-teacher conferences. But in her thirties, Diane began to wonder why her mother didn’t speak of her past. So she traveled to South Dakota and Nebraska, searching out records of her relatives through six generations, hungering to know their stories. She began to write a haunting account of the lives of her Dakota Indian family, based on research, to recreate their oral history that was lost, or repressed, or simply set aside as gritty issues of survival demanded attention. To ask other readers questions about Spirit Car, please sign up. Diane Wilson's beautifully crafted memoir begins with the traumatic 1862 event that creates fissures between Midwestern families, neighbors, and tribes, but this is mostly the story of a woman unburying her family's history and trying to begin the healing after hundreds of years of cultural genocide. Wilson's open, honest voice gives us a seat in her spirit car. I recommend you take the journey--it was very educational for me. Read this because it’s the new piece of the ninth grade curriculum, taking the place of To Kill a Mockingbird. I learned quite a bit, and it made me curious about visiting some of the locations in Minnesota where parts of the book take place. I wished I had a family tree from the beginning (because I read it in kindle, the chart is at the end so I didn’t know it was there until I finished), which would probably have made the back-and-forth in time less challenging to follow. A map would have bee Read this because it’s the new piece of the ninth grade curriculum, taking the place of To Kill a Mockingbird. I learned quite a bit, and it made me curious about visiting some of the locations in Minnesota where parts of the book take place. I wished I had a family tree from the beginning (because I read it in kindle, the chart is at the end so I didn’t know it was there until I finished), which would probably have made the back-and-forth in time less challenging to follow. A map would have been good as well, and I can see that being a helpful part of the supporting curriculum. There were lots of stories, individuals and even just single observations that would make for very interesting discussion topics, so it should be good for class conversation and book club reads. But when I had to finish it before my library loan ended, and I had a favorite mystery series waiting, I’ll admit it sometimes felt like homework to plow through. Spirit Car is a personal history that lays bare the fate of the Dakota survivors and their generations beyond their internment at Fort Snelling. I found it amazing that Wilson could trace her ancestry to the late 1700s. The decimation of the tribe (especially the men during the Indian wars, when only women and children were marched to Fort Snelling) and other factors described in this book such as the importance of family ties and tribal records kept concerning land ownership and membership made this possible. For example, she knows of the ancestor (one of many Olivers) who had joined the Renville Rangers and was among the Minnesota unit ordered to remain in Minnesota to fight the Indian wars rather than the Civil War. He was a half-breed, but he fought with the white man against the Dakota at Fort Ridgely. Her mother, and her maternal grand mother and great-grandmother bore large families. And they were poor. The fathers, being half-breeds, always had trouble finding work - moving around much of the state of South Dakota. The reservation land was marginal for farming and subject to drought and locusts. Game became scarce. One thing her family largely seemed to escape was disease. Although somewhat familiar with the role that Indian boarding schools had in destroying Native American culture, I was unaware of who was allowed to attend and how different the experience could be for 100% Native Americans and those of mixed race. Guess who was treated better! She closes the book at the end of the reenactment, thereby completing a circle and a journey, hers and her ancestors. Unfortunately, I had some struggles with the book. This may be cultural, but I am not sure that she should have written the first part of the book from the voices of her ancestors whose spirits told her their stories. But if you come to this book knowing and accepting that it will make for a better read. I have not had time to return to this book since February vacation, but here are my initial impressions. I really like the idea that the author wanted to attempt to re-create her family's lost history. While I have a tough time differentiating between creative non-fiction and historical fiction, I appreciate the pains she took to return to her mother's boarding school and to retrace the steps of her ancestors. If I had been her teenage daughter, I would not have enjoyed that road trip much, I su I have not had time to return to this book since February vacation, but here are my initial impressions. I really like the idea that the author wanted to attempt to re-create her family's lost history. While I have a tough time differentiating between creative non-fiction and historical fiction, I appreciate the pains she took to return to her mother's boarding school and to retrace the steps of her ancestors. If I had been her teenage daughter, I would not have enjoyed that road trip much, I suspect. One problem that I had early on, on page 35, was when the author was referencing the Dakota War of 1862. She states, "Nowhere was it suggested that this 'outbreak' was the backlash of decades of mistreatment that included continual for settlement of the smaller reservations, broken treaties starvation, and the ongoing humiliation of being treated as 'savages' (Wilson). Since I was thinking about the journalist "Bright Eyes," and her efforts on behalf of another Native American group, I wondered whether the author's generalization might be too sweeping to reflect adequate research. I understand the gist of her message about the unfair tactics that were used to against native people, but I still thought about her assertion with a slightly critical eye. On page 78, when she refers to the high numbers of Native American farmers on the relief roles, higher in South Dakota than in any other state, I made a contemporary connection to the reality that the federal sequestration is today impacting Native American schools in a disproportionate rate than school with more resources. I will finish the book and respond again, once I have gotten some more pressing things completed...perhaps during the upcoming vacation. This was Minneapolis's One Read last year and I'm trying to learn more about the history of racism in my city/state, so this book has been on my to-read list for quite a while. And honestly, I think I would have gotten to it sooner if it weren't for that god-awful cover. Seriously, I was bracing myself for a boring academic text and was pleasantly surprised by how readable she made the history of the Dakota. I'd heard a little before about the Dakota War (largely due to This American Life's ep on This was Minneapolis's One Read last year and I'm trying to learn more about the history of racism in my city/state, so this book has been on my to-read list for quite a while. And honestly, I think I would have gotten to it sooner if it weren't for that god-awful cover. Seriously, I was bracing myself for a boring academic text and was pleasantly surprised by how readable she made the history of the Dakota. I'd heard a little before about the Dakota War (largely due to This American Life's ep on it) and reservation schools, but this really tied it all together. It's mostly just one family's story, so I don't feel like I have a ton of facts about the general history of the Dakota, but it put a lot more emotion into the tidbits I knew and names like Lake Pepin, Ramsey, and Sibley. It was also interesting to read more about how the government encouraged interracial marriage and blood-quantum requirements and how mixed race people were not always welcomed in either community. 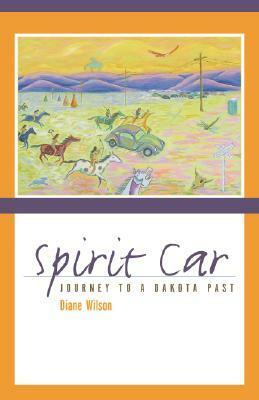 I read "Spirit Car: Journey to a Dakota Past" by Diane Wilson, published in 2006, for my S.E.E.D. Book Club. This is one of the more enlightening and enjoyable books I've read about the American Indian, specifically the Dakota, culture. In this family memoir Diane Wilson, who is one-eighth American Indian but has been essentially raised in a white/Swedish American world, goes in search of her Dakota history. She begins around the time of the Dakota War in the 1860's. I found this particularly int I read "Spirit Car: Journey to a Dakota Past" by Diane Wilson, published in 2006, for my S.E.E.D. Book Club. This is one of the more enlightening and enjoyable books I've read about the American Indian, specifically the Dakota, culture. In this family memoir Diane Wilson, who is one-eighth American Indian but has been essentially raised in a white/Swedish American world, goes in search of her Dakota history. She begins around the time of the Dakota War in the 1860's. I found this particularly interesting, especially in light of the Sculpture Garden controversy over the installation of "The Scaffold" sculpture. (https://www.nytimes.com/2017/09/13/ar... and http://www.startribune.com/wood-from-...) I knew little about the Dakota War before "The Scaffold" sculpture controversy and my reading of this book. Clearly, the Dakota War was a complex situation, as is clear in what led up to the War, in the roles that Wilson's ancestors played in the War, in Wilson's telling of the events, and in "The Scaffold" controversy. It was not simply a good guy, bad guy situation. My opinion is not a popular one, but I felt the forced taking down of "The Scaffold" was censorship. Prior to this, I am willing to bet that most Minnesotans knew little of the Dakota War. The controversy with the Sculpture Garden piece was an opportunity for education and civil discussion of the issue - and it was, literally and figuratively, buried instead. This event was a part of ALL of our histories and needs to be recognized and talked about. I appreciated Wilson's meticulous research and the use of the very complex family tree. Despite this, the reader has to pay close attention, as Wilson's work is filled with many "characters," and she moves back and forth in time. However, this work is much more linear than much of the more circular American Indian literature I've read in the past, making it easier to follow, for me anyway. I loved the local color found here. Having just taken two courses, one on the history of the Summit Avenue area and one of green spaces in the Twin Cities, I made lots of connections with things I had learned and seen in these courses (ie; Indian Mounds Regional Park). What I found most fascinating is that Wilson looks at the events she depicts here rather dispassionately and without judgment. Because she is biracial, she sees everything from at least two lenses, two "sides." I believed and trusted her as a result. p. xii - "In the process, I discovered just how deeply our identities are influenced by the forces of history." Yes, we ARE our history. Isn't it ironic, then, that we don't seem to learn form that history and seem doomed to repeat it? This reminded me that it is important to know our history in order to more fully understand ourselves. p. 10 - "I discovered a new truth: I was searching for the stories that had been lost from our family...As humans we need our stories surrounding us. We need context, we need myths, we need family legends in order to see the invisible legacy that follows us, that tells us who we are." BINGO! p. 32 - "They had signed up to fight the white man in the white man's war, but they would be asked instead to raise their arms against their own family, no matter on which side they chose to fight, in a war that would sunder their community. It was the ultimate contest between the past and all of the history and traditions that belonged to the tribe, and the future, as defined by the white's progress across the land, claiming everything in the name of civilization." p. 129 - "...'passing' as white was one way to survive in a hostile, racist world. This was a new form of silence - one of omission - that promised safety for the price of becoming invisible." p. 135 - "They set a fine example: work hard, complain little, laugh as often as you can. Cry only when you bury a parent or a child. No matter what happens, make the best of it. And always, always, place family first." p. 137 - "But what if knowing the truth about the past would change the we live in the present? What would it mean, for example, if we were held accountable not only for our own actions but also for those of history - for the actions and consequences of our relatives? Mixed bloods have sometimes been accused of taking advantage of both sides - white and Indian - neglecting their community while benefiting from the government's handouts. This is a complex issue, a tangle of hard choices, cultural values, and the need to survive. I have carried a vague feeling of shame all my life, a feeling whose origin I can't pinpoint." I have read books in the past with the Minnesota history of the mistreatment of the Native Americans, and the 1862 uprising, that were much better than this. Unfortunately, I have forgotten the name of the best one, but I read it in the 1960's, so maybe it was put out for the centennial. I found a list of books on the subject, and will take the Website name along to book club for those that are interested. Part memoir, part family history, part creative nonfiction, this book will punch you in the gut and leave you crying. IDK, I'm white, and though I was born in Minnesota, growing up mostly in Kap'oza, living now so so close to Mendota, it feels important - imperative, urgent even - to engage with Dakota stories in a meaningful way. Spirit Car was well-written. The circular structure wasn't difficult to follow along with. Some of the chapters would be good to use in a high school classroom when covering the Dakota War. Wilson made me think also of my relatives and who travels with me in my spirit car. I loved this book because it gave me a window into my adopted home I had not previously viewed. Also, as a genealogy geek, I appreciated her journey. A decent memoir. Native American view of Indian/white war of 1853. Diane Wilson is the descendent of a highly targeted ethnic group. With the discovery of her cultural background and the individuals who she knows as family pride and pain accompanied her uncovering who and where she came from. Diane with the support of her family and members of Native origin has helped to reveal the struggles and triumphs of a people with great tradition and intriguing legacy. One Minneapolis One Read is in the second annual community book read. Host and radio personality Garrison Keilor contributed to the magnificence of an extraordinary cause; literacy. There was a wonderful turnout of diversified crowd attendance. The live music and heart wrenching depictions helped the attendee feel like they were thrust into the context of the story being told. The ambiance of the event was splashed with elegance, and the eloquent speakers Diane, Garrison, guests, and audience members alike. There was an array of intelligent and inspiring questions raised, answers given, and phrases stated. City Council Vice President Robert Lilligren who is of Ugibway descent and the first Native to hold the position greeted those in attendance and introduced the program’s chain of events. Native advocate David Larsen gave the opening prayer and thanked Diane for writing the book in an effort to preserve the history of the Dakota people. He described his Native family as being “the most written about and least understood”. He then expressed his admiration for the effort Diane put forth to inform her people and members from other cultural backgrounds by proclaiming that “education is knowing your true identity”. I didn’t have the luxury of reading The Spirit Car previous to attending the event, but after following Keilor through his narrative description of how the story unfolds, my interest was piqued. Afterwards, a conversation was launched between Diane and Keilor. Excerpts read by the author were filled with enough passion and emotion to make me feel like my history was being told. The calamitous experience of the Dakota people is very similar to the struggle of the Africans in America. I was not familiar with some of the conditions that the Natives were subjected to. I did assume a more profound understanding of the character of the Native brothers and sisters after hearing what was told. Learning that in 1880-1940 100,000 Native children were forced to attend boarding school for the purpose of assimilation was shocking. Some concluded that the option prevented their children from suffering of starvation, which opted the decision to send them away. This alone gave me an ideal of how dismal the condition of the Dakota people was. Along with the detachment stemming from being away from their family European customs were instilled into the children causing this group of people to lose the tradition of their culture. The author used illustrations to provoke the reader to empathize with the circumstances, to be compassionate of the determination that the people possessed, and also to corroborate what the author states to be truths. One of the most impacting illustrations was of the prison camp of those who chose to fight against the imperialist force. I could only imagine the difficulty involved with making the decision to fight against your own family and loved ones. Indigenous and mixed blood had to choose sides, which meant you had to fight family against family. The One Read program is a tool to incorporate the community into participating in the support of widespread literacy. The event was educational to me being that I am a self-published author. I witnessed how to coordinate the promotion of a project on a larger scale. I paid close attention to the various elements of the event that created an impressionable experience. Most of all I was impressed with how Diane has taken on the attitude to transform a traumatic encounter into something positive that others can use to improve the quality of their lives. Visit: www.tosucceedyoumustread.com for more information on the "To Succeed You Must Read" literacy campaign. Talk about bringing history alive - Diane Wilson's SPIRIT CAR does that and more. Using what has been called "intuitive anthropology," Wilson devotes half of her book to telling accurate-as-possible, materially backed stories about the history of Native Americans in the Midwest. In the other half, the bicultural Minnesota author tells of her journey "back in time" as she travels the path her indigenous American ancestors took to Minnesota from their homeland of South Dakota. One particularly imp Talk about bringing history alive - Diane Wilson's SPIRIT CAR does that and more. Using what has been called "intuitive anthropology," Wilson devotes half of her book to telling accurate-as-possible, materially backed stories about the history of Native Americans in the Midwest. In the other half, the bicultural Minnesota author tells of her journey "back in time" as she travels the path her indigenous American ancestors took to Minnesota from their homeland of South Dakota. One particularly important chapter "extrapolates historical stories" (as Wilson puts it) about the Dakota War of 1862 and its Renville Rangers. The Rangers were a group of soldiers in the war who were often men of bicultural heritage, spoke both English and Dakota, and thereby helped (through fear, coercion, or personal need) the white military navigate native lands and culture to capture those indigenous people with whom they were embattled. This time in history is referred to in the recent free YouTube documentary called "The Dakota 38," in which a group of Crow Creek and other Native Americans travel on horseback in freezing December weather to trace the path of their ancestors much as Diane Wilson did. In the fascinating documentary, however, these riders are going forward in time, as though undoing the exile their ancestors faced in 1862 when 38 Native Americans were publicly hung for fighting white settlers, and their families were forced onto Crow Creek reservation in the middle of South Dakota. I was fortunate enough to hear Diane Wilson speak about her journey in writing this book as she and this book were featured by the Minnesota History Society and the book was 2012's "Minneapolis One Read" selection. I was also fortunate, as we all can be, to see the documentary on the Dakota 38, a vitally important history that all-too-few people know about. I should say too few white people know about it, as I am certain that a large portion of indigenous Americans can hardly forget or avoid knowing about a time in history when the American government broke official treaties and afterward participated in killing the native people who simply didn't want to leave the homes they and their people had known for millennia. On that note, I should say Wilson does not make this a "political book," a rant on the injustices of the Dakota War of 1862, the hanging of the Dakota 38 (+2, actually - see the documentary for explanation), or the general dis-ease in the regional Native American communities about their historical displacement and mistreatment. She provides an intriguing background for important material in appropriately storytelling form, as most people do need to be informed about this era. In the second half of her book, she changes to memoir format and traces an intensely personal journey that culminates in a poignant but hopeful chapter on "Reconciliation." Initially I was enthusiastic to read this book due to the combination to genres-memoir, fiction and history. I was intrigued by a new term- "intuitive anthropology". While it seemed Wilson achieved her goal of being historically accurate, I found many parts to be difficult to follow or even quite boring. I almost gave up on the book entirely and found myself skimming part one. More recently, while making a valiant attempt to connect with Book Two, it all came together for me in a grand way. I a Initially I was enthusiastic to read this book due to the combination to genres-memoir, fiction and history. I was intrigued by a new term- "intuitive anthropology". While it seemed Wilson achieved her goal of being historically accurate, I found many parts to be difficult to follow or even quite boring. I almost gave up on the book entirely and found myself skimming part one. More recently, while making a valiant attempt to connect with Book Two, it all came together for me in a grand way. I am a person who always searches for "nuggets" of deeper meaning, life lessons. I love to reflect on quotes. For me it happened as I was browsing looking at the photographs. I was struck by the uncanny resemblance of some of the Dion sisters to my grandmother (Memere to me). I began to think about how often I have seen photos of Native people and have had this same thought before. I have always been concerned about "lost stories" in my family. As an educator, I saw first hand how empowering it can be when we had students interview relatives to trace their roots back to a country of origin. As I read the chapter about the "prison" otherwise called boarding schools, I reflected on the struggle to claim ones heritage while trying to assimilate. I began to wonder if some of our students living in two worlds-home and school- feel this same togmof war. Are we doing enough to recognize and celebrate each family's unique "story"? Honestly, I'm ambivalent about this book. Will see if that translates into coherent thoughts tomorrow. I read this book as part of the One Minneapolis One Read program, because my law firm was a sponsor and it looked interesting. I attended an event related to the book last night at the Minnneapolis Convention Center with the author and Garrison Keillor, and I think it crystallized in my head the reason for my ambivalence. I was not particularly familiar with the Dakota war, or the forced march t Honestly, I'm ambivalent about this book. Will see if that translates into coherent thoughts tomorrow. I was not particularly familiar with the Dakota war, or the forced march that followed. And the story itself was fascinating, terrible, traumatic, and very worthy of telling. But I am fairly familiar with the history of US/American Indian relations, so it wasn't surprising. The long legacy of the boarding schools as told in the book was also really interesting -- I have read a lot of other books and articles about boarding schools and forced assimilation, and this is an aspect (the the schools continued fostered by not force but poverty and dependence) that I hadn't seen interrogated much. But the book skips over a lot of the historical details that would have provided more context: the broader history of schools, the failure until ICWA to even change the custody rules, etc. More frustratingly, to me, the book doesn't explain a lot of the terms of the annuity agreements and treaties that led to the 1862 Dakota war in the first place. So, basically, I think that this was an excellent and important story, told from an interesting perspective, but not an excellent book. Parts were well written, but not all, and there were gaps that made it hard to follow the story at times. I liked the event, I love the program, and I think the book would make a good primer if you didn't know anything about the legacy of the Dakota in Minnesota, but I would have liked more historical detail and interrogation. Spirit Car is part novel, part memoir, and part history - the story of the author's retracing of her Dakota roots, of the Dakota uprising of 1862 and the misery that came afterward, of the author's family history (told in creative form), and of the reclamation of the Dakota story by Dakota people themselves. I was absorbed for the first two-thirds of the book, though the prose sometimes felt too simple - perhaps a product of the meld between memoir and novel that winds through those pages. But th Spirit Car is part novel, part memoir, and part history - the story of the author's retracing of her Dakota roots, of the Dakota uprising of 1862 and the misery that came afterward, of the author's family history (told in creative form), and of the reclamation of the Dakota story by Dakota people themselves. I was absorbed for the first two-thirds of the book, though the prose sometimes felt too simple - perhaps a product of the meld between memoir and novel that winds through those pages. But the last third of the book, where the author joins the Dakota memorial march from Nebraska to Fort Snelling, near St. Paul, is an astonishing, powerful piece of writing - the sense that the places each marcher walks know the history the marchers are reclaiming is palpable. The book turns out to be a stunning meditation on identity, culture, colonialism, and assimilation. I'm left deeply thoughtful by the power of its ending. Beautifully written book. The author, in an effort to learn more about her mother's Dakota Indian ancestry, traces her family back to the Dakota War of 1862 in southwest Minnesota. She brings to life each generation and their struggle between claiming their Dakota heritage and assimilating into the "white" world. The book also provides insight into government policies about Indians/Native Americans over the years. The book begins and ends with the 2002 commemorative march tracing the route the Da Beautifully written book. The author, in an effort to learn more about her mother's Dakota Indian ancestry, traces her family back to the Dakota War of 1862 in southwest Minnesota. She brings to life each generation and their struggle between claiming their Dakota heritage and assimilating into the "white" world. The book also provides insight into government policies about Indians/Native Americans over the years. The author's story about her search for her Dakota family past and Dakota history. This is an example to me of an important book that is not necessarily a good book. For the first 100 pages, I could lose myself in the author's family history. She created fairly vivid imagery of her ancestors and it interested me. But in the second half, when Wilson recounts her every move in finding graves and mention of various ancestors in newspapers, it starts to drag and the pace never picks up again. I can u The author's story about her search for her Dakota family past and Dakota history. This book is a great tribute to the author's family and heritage. In trying to learn more about her mother's Dakota Indian ancestry, traces her family back to the Dakota War of 1862 in southwest Minnesota. She follows her Native American heritage, one that her mother left behind as she grew up and married. The author brings to life each generation and their struggle between claiming their Dakota heritage and assimilating into the "white" world. The book is part memoir and part history. The journe This book is a great tribute to the author's family and heritage. The book is part memoir and part history. The journey of the author brings closure to the pain of the mother's past. I loved this book. It was personal, about her family, but it was also about the history of the Midwest and the U.S. More than any other book I've read about the deplorable manner in which Native Americans have been treated since Europeans arrived here, this book will make me look differently at the land around me, every day. Also, despite the fact that our family histories are very different, it made me want to look more deeply into my own family history. It had its moments, but this feels like one of those books that would have worked better as an essay or an article. Despite her many years of research, the author didn't uncover that many facts. She seemed always to be padding the story with peripheral material and repeating herself. The description of the 2002 march was powerful, and her family's story is significant, but it didn't warrant a whole book. Personalized memoir and history of the Dakota War, starting with mid-1860's battles between the whites and Native Americans, through the aftermath. The endless interviews of distant relatives are not all that interesting. I think Minnesota has produced better memoirs. I found Brenda Child's book 'Holding Our World Together" better written and more inclusive of history and cultural depth. Different genre. Very interesting and intense description of the Dakota War in 1862. The consequences of that war deepened the historical trauma between the whites and the American Indian Dakotas. The book discusses the issue of being torn apart between two cultures..being half indian and and half white. I did not like about the book that it became a little boring after about 70% of it. I really appreciated this book and the insight it offered into the life of a woman who is part European/part Native American. I enjoyed hearing the history of Minnesota brought to life. I was left wondering why she had to pick just one culture to follow (Native American). Isn't there a way to mesh both the European and Native parts of herself? That was disappointing.